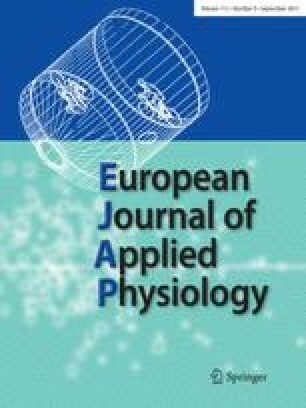 The relationship between relative force, electromyogram (EMG) and time to fatigue was examined in seven male and seven female subjects [mean (SD) age, 21.7 (3.2) years] during isometric handgrip exercise. Subjects performed sustained submaximal contractions of the right handgrip at three different intensities: 30%, 50%, and 75% of the pretrial maximum voluntary contraction (MVC). EMG was sampled in 1-s epochs every 15 s during the contractions, and the integrated EMG (IEMG) values were then normalized to that of the pretrial MVC. As expected, time to fatigue was longest at 30% MVC and shortest at 75% MVC, but women performed consistently longer than men at each of the three intensities [woman vs men; 400.7 (35.8) vs 364.3 (34.4) s, 205.1 (15.6) vs 139.4 (13) s, and 89.9 (11.4) vs 66.4 (6.4) s, for 30%, 50%, and 75% MVC, respectively; P < 0.05)]. IEMG increased in a non-linear fashion over time during each trial, with the magnitude of IEMG being proportional to the intensity of the contraction. At the endurance limit, IEMG was greatest in the 75% MVC trial, however, no IEMG values reached those obtained in the related MVC [30%, 57.2 (6.9)%; 50%, 84.6 (5.7)%; 75%, 92.8 (7.4)%]. In conclusion, endurance time during sustained submaximal isometric handgrip exercise is dependent up on the intensity of the effort, with women having significantly larger endurance times than men. The related increase in IEMG is also proportional to the intensity of effort, however, the factors causing force to fail prior to the final IEMG reaching its predicted maximum remain to be elucidated.